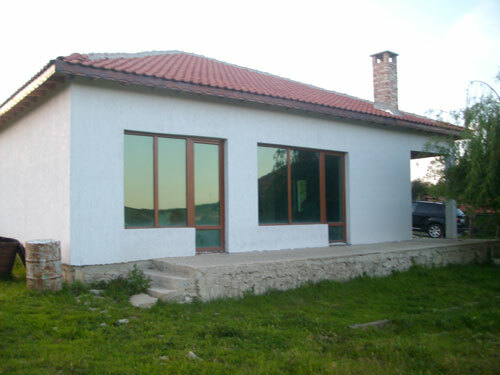 The house is situated in Goren Chiflik village. The house has a built-up space of 144 sq.m. and a yard space of 1360 sq.m. The house is on a single floor and is comprised of a living room which has a fireplace, kitchen box, corridor with an exit towards the yard, large bathroom with WC, 3 bedrooms one of which has a bathroom with a WC. There is a large barbecue in the yard. The house is currently on finishing works and is offered in a complete condition. The village of Goren Chiflik is located in North-East Bulgaria at 5km from Varna - Bourgas highway. It is included in the Municipality Dolni Chiflik (Varna District). The closest town Dolen Chiflik (a municipal countryside town) which is located about 2 km from the village. Goren Chiflik is at distance of 50 km. from city of Varna, 25 km. from the Black Sea Coast and the Shcorpilovtsi Sea Resort. The Nature Reserve - Longouza is situated in close distance and the whole area is also popular as a hunting & fishing spot with local hunting grounds. The big and picturesque Lake of Tsonevo is located just 15 km. further and the River Kamchia is 5 km. away.